No, you don't understand. We have a thing for strawberries. Every summer we go berry picking as a company. Each Independence Day we do a potluck and all of the desserts are red, white, and blue with strawberries on top. We make pies, smoothies, and cakes. There's a strawberry jam and jelly exchange. We watch documentaries. Exchange facts and recipes. And we may or may not take strawberry breaks when they're in season. 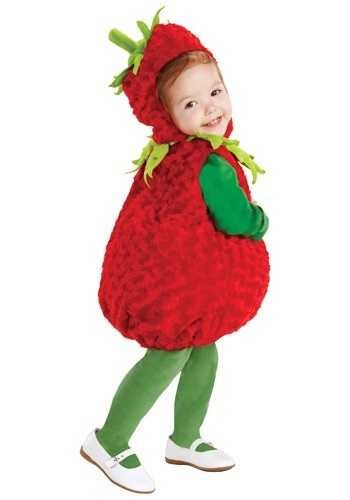 And now you're telling us that your kid is so sweet you're dressing them up as a strawberry? We're not sure if we can handle that. Like, if we see your adorable little kid walking around dressed as our favorite fruit, we might try to eat them. Or at least put them on a shortcake. Maybe just douse them in whipped cream. No? Well, yeah, you're right. They probably wouldn't taste the same as an actual strawberry. But they sure look delectable in our Toddler Red Strawberry Costume. With the puffy red body, plump like a ripe berry. And that cute little hat with stem! They look downright tasty. It's okay. We do realize there's a kid hidden somewhere in that bright berry red outfit. So don't worry, we won't try and turn them into a dessert, even though they certainly look sweet. Berry sweet.